but it might just be helpful! What to do- Make your every day banana smoothie as you normally would (go on, add in an extra banana for good measure.) Now pop it in the freezer and leave it for a little. For ease of eating, don’t wait until it’s frozen through. Guaranteed to make small people happy on hot summer days, and big people rather content. Whizz it all up and into the freezer. Drizzle on some honey just before eating and spoon out as you would regular ice cream. Just the thing for cooling off on a hot day. Do you have any regular foods you tweak for extra hot days? 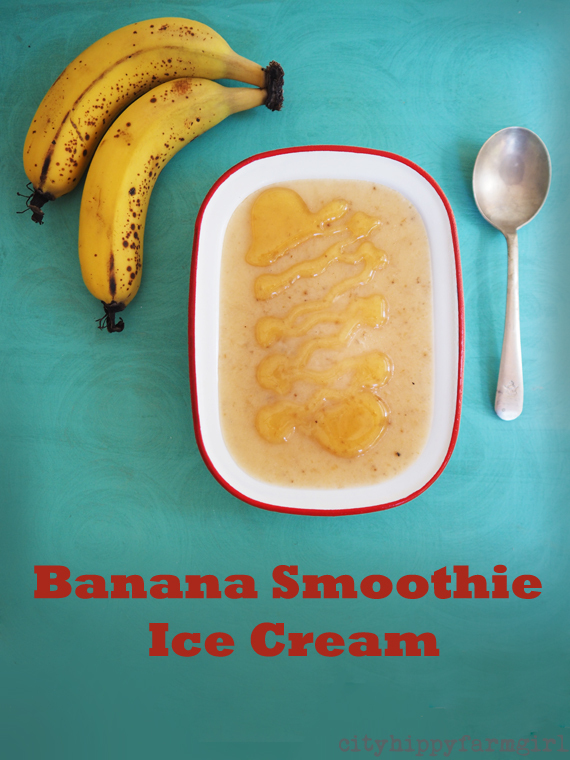 This entry was posted in Food Glorious Food and tagged banana smoothie, easy, frugal, frugal eating, hand made, ice cream, kids, no churn, summer by cityhippyfarmgirl. Bookmark the permalink. 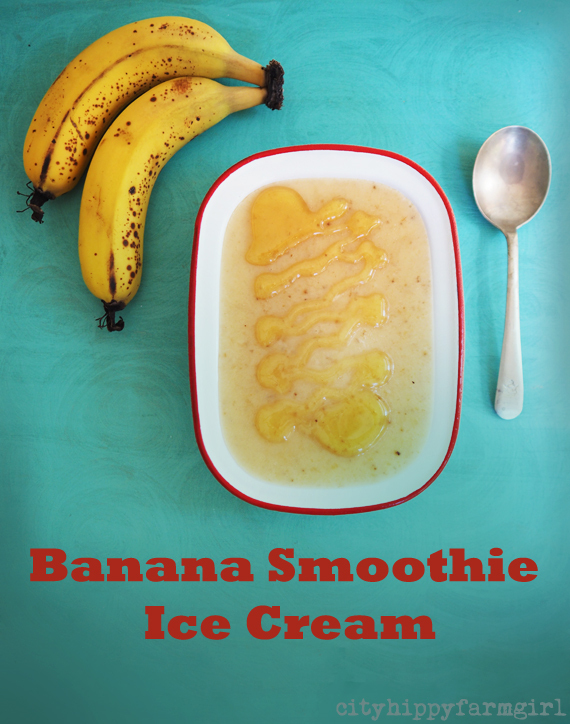 Like banana milk ice-cream – delicious! This is the best and quickest way. I’ve been using Pureharvest Coconut milk especially for little Archie. Yes always with a little bit of raw honey! That looks like a lot of fun. We usually pop our left over smoothie into icy-pole moulds for hot afternoons, but the image of all my kids eating straight from that enamel pie dish is a a very appealing one! We did frozen mangoes with frozen bananas thrown in the other day – we put the mix into popsicle holders with some blueberries popped into the bottom of the container before adding in the banana and mango mix. Our 3 year old daughter (and us) love them! A beautiful texture! At this time of the year, the mangoes go off quickly so when the mangoes get too old to sell, or have bruises on, the market staff cut them up into trays for really cheap. We bring them home and stick the slices straight into the freezer for use in smoothies later. Yum! bananas go off too so, yep, straight into the freezer they go too before getting too brown.